Think that your phone got stolen and after a few days you come to know that its with someone, who already knows that its yours. What should be your response? If you are aggressive then you will go for hitting the man that why he didn’t returned or if you are mature then you will make a polite request that please return my thing back. What if the person doesn’t reply or ignore all your requests? What will you do? Seems like a roadside bully story, but very strange that it’s now becoming today’s fastest growing trend in tech world. Reviews, pre-views, leaks, lost prototypes been such frequent incidences that even we started assuming that bloggers are above law and they have rights to tell people what they wanted to tell. Somehow we sympathize investigative reporters that they risk themselves to bring insider leaks in great interest of public and whenever someone such even after using all legally wrong means get nailed by authorities, then we speak in support of him because what he did was in greater interest of public. But aren’t such trends getting much harder to be tolerated by even most polite authorities? I could also discuss that what damage the early review of an unfinished product cost to Apple’s iPhone release, I could also talk that how a biased pre-review of an alleged ‘stolen’ proto forced Nokia to announce a product much earlier before their team could even finish it. I could also also talk about series of biased posts from the man himself and also mention my own past with some similar situation, where I was like Eldar in start of my blogging days … but many analysts will be out there to talk on that. Let me go simple here. I guess today in early morning, we got to see a post from a public consultant about smart phones named Eldar Murtazin, who claimed that some Russian officials contacted him in morning asking for location of mobile-review.com over the leaks of Nokia N8 as Nokia complained with them that their trade secrets has been stolen and misused to cause a confusion. Later even Nokia’s official words followed in. Its their own prototype, even has mention of the same on it, stores are all around the globe that one could drop the proto back, but still they were helpless saying Please for their own thing and answerless since April 27, 2010. Eldar’s excuse, he has been on ‘vacation’, so didn’t got any letter even if received in office, Nokia has no proof that he received any letter as he wasn’t in office. How innocent this guy is… even Gizmodo wasn’t. He also admit that Nokia sent him mail about sending their properties back, but what was his reply? He said which device in particular, I am testing many of them? Please mention. One can really understand that how annoying it might be for a company that trying hard to nice with one, who even after stealing their property, ruining their strategies, ruining their PR and knowing exactly what they are talking about asks back that which proto you talking about?? Is their any law exists about own property, own expense, own hard work? Any moral? May be we enjoyed Gizmodo, when he leaked out one of the biggest secret people were after, may be Gizmodo earned a lot from that. May be Mobile-Review.com earning good attention due to Edlar, but don’t you think that it will lead to worse for bloggers all around the world? Aren’t the respect or a little relaxations we blogger enjoy now days gonna be on sake, when some of biggies show such disrespect to laws and morals? Yes!! Eldar.. you don’t need to care about thoughts coz you are so big for readers. Congr8s. Why didn’t you mention that you replied which prototype in particular? I have many of them. Great answer. Eldar is sure much of innocent lad out there. He just got a proto down somewhere, may be bar again 😉 though to write post over it and then was so happy that went for a leave of month. 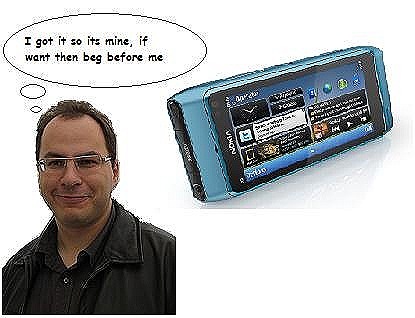 Nokia had already posted a nice request to him on their blog asking him to give the device back about a month ago. Eldar Murtazin also works as a consultant for Samsung. I think this fact alone compromises his credibility as a reviewer or “journalist”. Who knows what other Nokia trade secrets he has been able to pass on to Samsung.